I cannot wait until my copy of this book arrives. Michelle Kienholz has partnered with scientists, clinicians, and public health researchers from all disciplines at dozens of universities to develop grant applications for almost every federal agency, including most grant mechanisms for each of the institutes and centers at the NIH. She volunteers her knowledge and experience on her popular blog, Medical Writing, Editing and Grantsmanship (as writedit), through which she has learned the most common and vexing concerns of researchers who interact with the NIH and how best to foster a partnership between investigators and NIH personnel. joined the University of Pittsburgh in June 2011 as the associate senior vice chancellor for science strategy and planning in the health sciences and a faculty member in the Department of Computational and Systems Biology. Prior, Dr. Berg became director of the National Institute of General Medical Sciences (NIGMS) at the National Institutes of Health (NIH) in November 2003.
is, well, familiar to our readership as the prior head of NIGMS, blogger and provider of much grant-funding data. Berg recently twitted a teaser graph from the book which finally coughs up a comparison of funding policy for several ICs. According to the Twitter comment it refers to FY 2012 trends. Nine ICs were willing to cough up data on the percentage of grants funded by the percentile they achieved at study section review. Lower is better, in NIH parlance so you can see that almost everything in the top 7-10% is getting funded across the ICs. Once you get to the top 35th percentile, your chances of funding are almost (but not quite) nil. What is of best interest here is that we can finally see contrasting IC styles. There are 28 total ICs so this is just a subset but the NCI is huge and the NIMH is no slouch either. The topic domains range from cancer to the brain to metabolic to infectious disease to basic science so there is some breadth there too. I like this as a representative picture although we must always remain suspicious that those who chose not to send the authors their data might have done so for…..reasons. Anyhow, what jumps out at me first is that NINDS has the sharpest dropoff past their apparent payline. If I am not mistaken, this is precisely the IC that is rumoured to assert their strictness with respect to payline. Strictness involves two choice points of the Program Staff. Whether to skip over grants that fall below (better than) the payline and whether to pick up grants that fall above the payline. 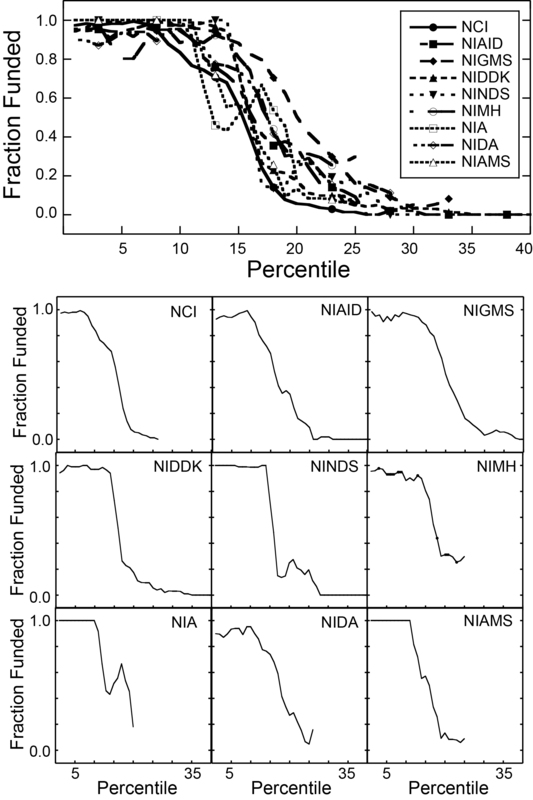 Although I do seem to spot some skips under the payline for NINDS, NIA and NIAMS do not appear to have a similar skips. All the other graphs do appear to show skipping behavior. On the other side of “strict payline” behavior, clearly NINDS has funded some grants above their readily apparent payline. It’s just that the distribution drops off much more steeply for them. I note that NIGMS, NIDA and NIAID seem to have the smoothest curves of pickups away from the apparent payline. The reason I say “apparent” payline is that some institutes, of which NIDA and NIMH are two iirc, insist they do not have a payline. What I have asserted since I noticed Berg’s posting of NIGMS’ funding decisions is that published payline or not, ICs follow roughly the same behavior. These charts demonstrate that. All that differs is the slope of the curve defining above-apparent-payline pickups. I’m hoping I’ll have more to discuss once my copy of the book arrives. The Food and Drug Administration has ordered DNA testing company 23andMe to stop marketing its over-the-counter genetic test, saying it’s being sold illegally to diagnose diseases, and with no proof it actually works. I did not see this coming at all. Guess I was too focused on thinking about informed consent issues. It will be interesting to watch our favorite NIH Institutes’ behavior with regard to starting grants for this round. Traditionally, many ICs are conservative with the Dec 1 start dates when Congress has us under Continuing Resolution instead of a real appropriation. The NIH ICs wait until late Jan-early Mar in hopes that Congress will act. It is pretty clear, however, that CR is the best we can hope for until at least Feb of 2015 with a new Congress in place. The possible upside is that the NIH ICs will just go ahead and roll out grants for Dec 1 under the realization that budget levels are predictable at current amounts. An article in the CHE raises the spectre of the NIH limiting the number of grant applications that a given University may submit. At a time of dwindling federal budgets, the National Institutes of Health is considering one sure-fire way to raise record-low grant-approval rates: Have researchers apply for fewer grants. According to how it was written this thinking is due to comments from Sally Rockey, head of Extramural Research at the NIH. One idea getting some internal study, said Sally J. Rockey, the NIH’s deputy director for extramural research, is to press universities—or perhaps even force them—to simply submit fewer grant applications. Either way, the NIH is not looking to push anything on universities that they don’t want, Ms. Rockey said. “We have to have a conversation together about how to do all this,” she said. It tends to leave you with the impression the NIH is actively considering this as an option. So Rockey clarified matters on her blog. I have seen the very recent report and follow-on discussions that NIH is considering asking institutions to limit grant applications as a way to control demand. Let me present the facts. You may remember the dialogue we had back in October 2011 on how NIH should manage science in fiscally challenging times. The option of limiting applications was raised at that time but was discarded at the outset and we are not pursuing it now. The discussion of how to manage NIH funds that we had in October 2011 was engaging and informative, and did result in changes in policy. … The community offered lots of other ideas as well that we may decide to consider sometime in the future, but at the moment limiting applications by institution is not one of them. There is tremendous pressure in the US culture (that I have come across to date) for middle to upper middle class (and even wealthy folks), no matter their circumstances, to consider their lives to be very busy and stressful. NO MATTER ONE IOTA THE OBJECTIVE FACTS. And if their lives are in some way NOT stressful, people have this unbelievable need to make things MORE stressful for themselves. Working folks, Stay and home parents and retirees alike. Yes, including you. and me. All I can say is that for me, understanding this cultural drive people have to pretend stress and overwork makes it a TINY bit more understandable. Perplexing in the specific case perhaps, but vaguely understandable in the general. This is my annual no-promises request for you, my Readers, to turn the tables. I am interested in what you all have to say, scientifically. So, if inclined drop your presentation details here in the comments* or send me an email. Drugmnky at the google mail. Also, there will be BANTER. Those of us in the neurosciences are preparing for our largest annual scientific gathering. I like to remind you to attend to a certain little task to assist with the odds of obtaining NIH grant funding. This includes a little bit of homework on your part, so block out an hour or two with your coffee cup. Part of the process of sustained NIH funding includes the long game of developing interpersonal relationships with the Program Officers that staff the NIH ICs of interest to our individual research areas. Sure, they do turn over a bit and may jump ICs but I’ve had some POs involved with my proposals for essentially the entire duration of my funded career to date. Many scientists find the schmoozing process to be uncomfortable and perhaps even distasteful. To this I can only reply “Well, do you want to get funded or not?”. One of the most important things you are going to do during the upcoming SfN Annual Meeting in San Diego is to stroll around NIH row. Right?